As older teens and adults become more self-conscious about their crooked teeth, the thought of wearing metal braces can seem contrary to their desire for a more attractive smile. Fortunately, many patients qualify for more discreet treatment with Invisalign® – a system of clear, aligners that straighten teeth without having to rely on brackets and wires. Invisalign® aligners are virtually invisible while in place and can be temporarily removed, unlike traditional brackets. Patients who’ve previously undergone orthodontic treatment and have experienced a relapse are among the most viable candidates for Invisalign® clear aligners. The beauty of clear aligners is that they follow the same orthodontic principles of traditional braces – to safely and gradually move crooked teeth into straighter and more appropriate positions. Each aligner is unique to your teeth and the series of aligners move your teeth into their prescribed positions. The most noticeable benefit of Invisalign® is that they can correct orthodontic concerns without making your treatment obvious. Because the aligners are removable, you can take them off before eating a meal, or before brushing and flossing your teeth. 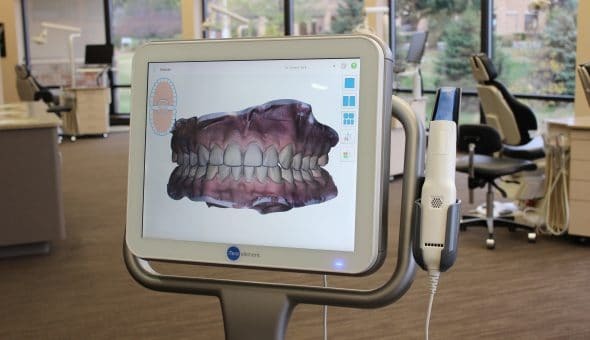 The iTero scanner eliminates the need for dental impressions. The scan is sent directly to Invisalign® and is comfortable, fast and accurate. The scanned data is adjusted by Dr. Davies and used by Invisalign® to fabricate the aligners, with a significantly reduced turnaround time. With Invisalign®, you can enjoy a healthier and more attractive smile while avoiding the need for braces! To find out if you qualify for Invisalign®, call Davies Orthodontics at (262) 542-9151. With offices conveniently located in Waukesha and Oconomowoc, WI, we proudly serve families throughout all of our surrounding communities.